Duffy’s Cut is the name of a stretch of land along railroad tracks about 30 miles west of Philadelphia, USA. The tracks belonged to the Philadelphia and Columbia Railroad in the summer and fall of 1832. 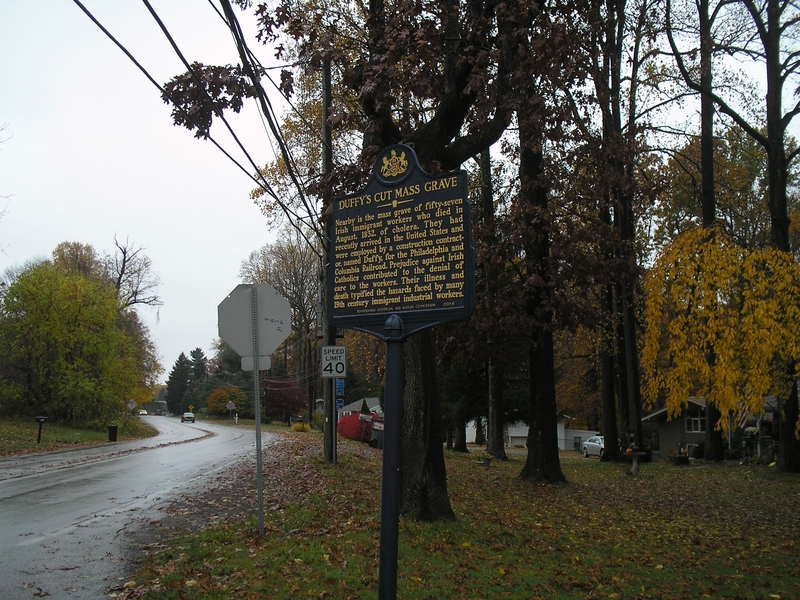 The line later became part of the Pennsylvania Railroad. Phillip Duffy, then a railroad contractor of the railroad and himself an Irish immigrant from a generation before, hired 57 Irish workers to help build this stretch of railroad. They arrived from Donegal, Terry, and Tyrone on the ship named John Stamp and were quickly hired by John Duffy. Six weeks later, all 57 were dead and piled into a hole in the ground, unmarked. It was believed that they died of cholera, which was an epidemic that was widespread at the time. In August 2004, two brothers – one a minister and the other a university professor, began a project to find out what happened to those 57 Irish who came for survival. This began from one of the brothers finding a document belonging to his grandfather–who was a high assistant to the president of the Pennsylvania Railroad. The document mentioned the hidden gravesite of these men. Soon with further investigation, there seemed to be a pattern that showed a cover-up of some things, pointing to events more intentional than death by disease. In addition, one of the brothers experienced seeing an apparition believed to be of these workers. There has been a long legend of ghost sightings and folk stories surrounding the Duffy’s Cut, from the local Pennsylvania community to Ireland. The Duffy’s Cut Project ( http://duffyscut.immaculata.edu/ ) was initiated in 2004 to find out what actually happened to these 57 Irish immigrants who had traveled to the US to find a better life. The work was arduous in that they had to locate the workers’ remains whose locations were unknown. But soon there was a breakthrough. In the 1800s and into the turn to the next century, prejudice against immigrants was high. Many had come during the industrializing era for work for new dreams and to escape strife and poverty and famines in their own lands. Competition created by the uneven and prejudiced actions of reward/punishment and availability created strife between many of the new immigrant groups and sometimes used against each other by the companies. Labor unions were quite new at the time. So most of the leaders and management groups were free to do what they wanted with their workers. Prejudice against the Irish-Catholic people were high during this time. This also created a lack of care and concern for most of the workers’ struggles, which intensified with the general attitude of the management and townspeople, toward Irish Catholics. Most historians, sociologists, and anthropologists who have studied the industrial era and railroads, understand the grounds near railroads, lakes, and bridges, to be lined with the bodies of people whose lives no one knows or remembers. Such is the road of progress and industrialization. This does not make killing and forgotten ancestors inevitable, however, or right or a part of progress. It is a question of collective grieving and its necessity in our times. It is also the work of remembering which is so difficult now. I am forever grateful and filled with tears when thinking of the dedicated work of Frank and Bill Watson in Philadelphia, who followed the ghosts who came to them for a justice that was close to two centuries old by this time. Mass graves are not only what certain countries do. The founding and building of nations often show that it is done at tremendous costs.